-Added self-contained menu skinning for Windows 8/8.1(though WindowBlinds skins will still work globally). See the "Which theme do you want to use" dropdown for an example. A library section for new ones is available at http://www.wincustomize.com/explore/start8_menus. 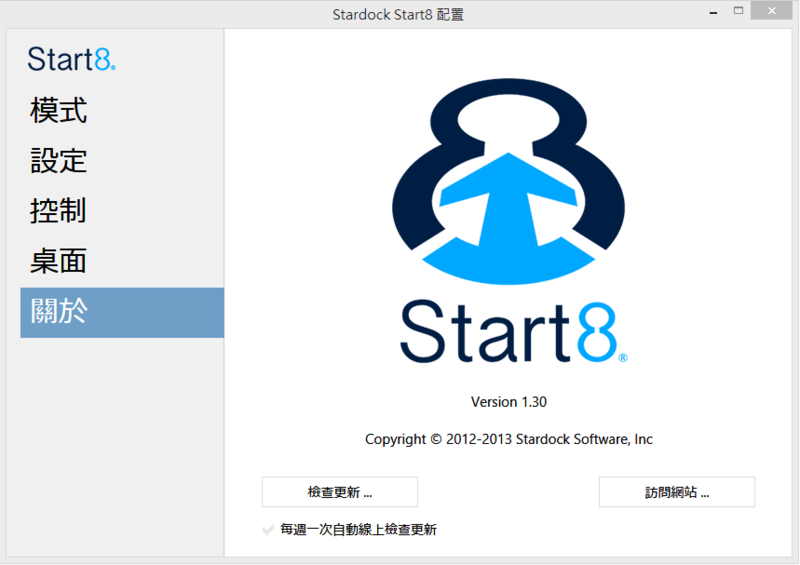 -The included Start8ThemeEdit.exe (in the application folder) can be used to create new Start8 menu skins. -New default Start button image. The Windows logo is no longer available as a default selection. You can download additional Start8 buttonsfrom WinCustomize.com! -New features under Control for "Start button shows Windows 8 menu unless docked" and "Start button shows Start8 menu unless in tablet mode" for slate and convertible machines respectively. Users with those machines must manually select one of those options, if they wish to use them. -Windows 8-style start menu options are available on Windows 8.1 RTM. There are additional options for keeping the taskbar visible and defaulting to the Application view.